In The Lightlings, Dr. R.C. Sproul weaves an allegorical tale that captures the essence of the biblical story of redemption in a manner that will fascinate and delight children. A race of tiny beings known as lightlings are a picture of humanity as they pass through all the stages of the biblical drama - creation, fall, and redemption. In the end, children will understand why some people fear light more than darkness, but why they need never fear darkness again. The Lightlings is an excellent introduction to the key themes of Scripture. Richly detailed illustrations by Justin Gerard will hold children’s interest, and discussion questions with Scripture references in the back will help parents guide children into the deeper meaning of the story. People tend to understand life lessons in different ways. One way of learning is through stories. Jesus used this method often in His teaching; we call them the parables. Stories take the lesson itself and simplify it, making it easier to understand. R.C. Sproul takes the stories of Creation, the Fall of Man, and the Redemption of Christ and forms them into a unique story that children of all ages can understand. 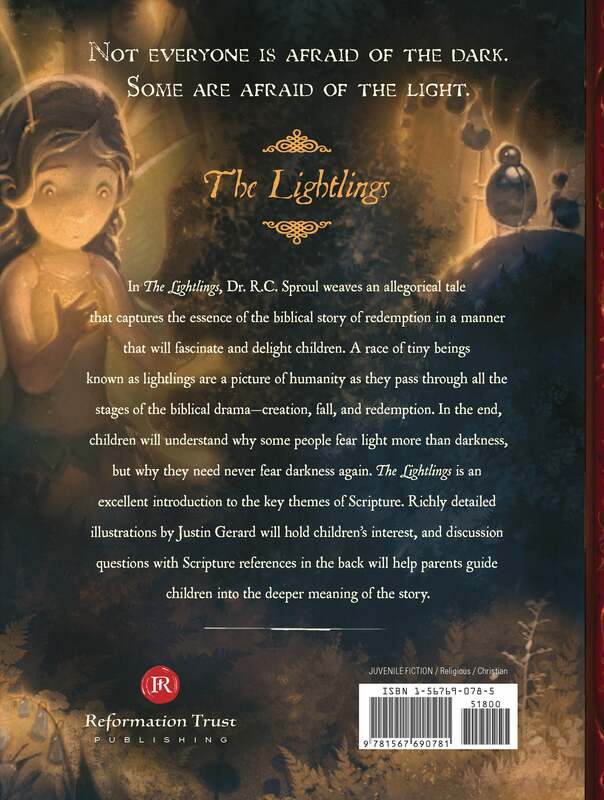 The Lightlings is another wonderful children's book by R. C. Sproul. This precious story ties two familiar "stories" from the Bible together perfectly. I loved how the author pulls these stories together to teach about redemption in Christ. So many children's books simply tell one single story from the Bible and leave it separate from the bigger picture. I would highly recommend this book! I received a free copy of this book from The Reformation Trust in exchange for my fair and honest review. As a parent, one faces the task of presenting the deep truths of the Bible to your kids from an early age. R.C. has a bit of fame for not only being a Bible expositor, but a children's author as well. 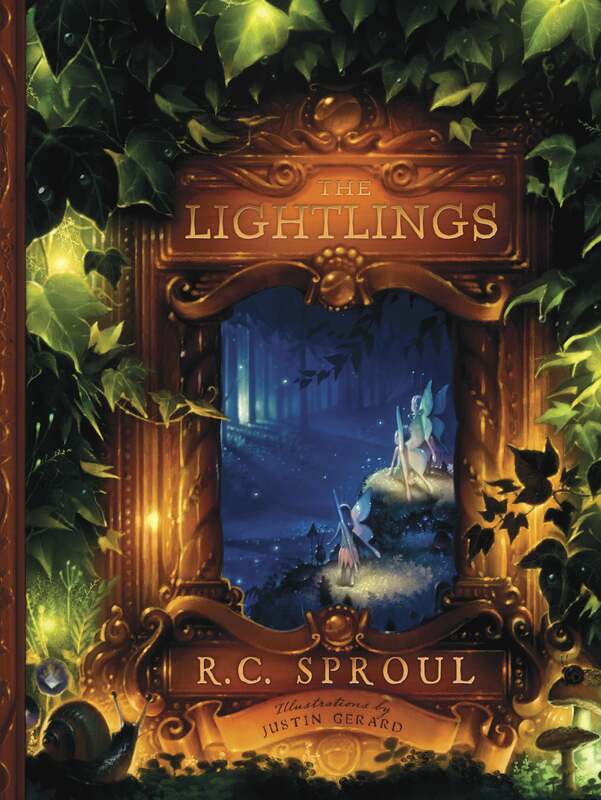 In The Lightlings, Sproul presents the biblical story of salvation in an allegorical tale of a people known as the lightlings, which is sure to captivate a young audience. The bulk of this short book is the tale itself. We meet meet Charlie Cobb who asks a perplexing question to his mom before going to bed, 'Mommy? Why am I afraid of the dark?' His mom, not knowing what to say, offers the suggestion of asking Charlie's grandpa the next day. The next day before dinner, Charlie asks Grandpa the question; thus, the allegorical story begins. A helpful addition is included at the end where parents have the ability to lead their kids in a deeper assessment of the rich biblical truths presented in the story. Though the intended audience is for ages 6 through 12, I particularly enjoyed the simplicity of this allegory. I look forward to the day, Lord willing, when I will have the duty and responsibility of rearing my children in the ways of God and sharing with them the deep doctrines of sin, grace, salvation, and redemption found in Christ. I think Sproul's tale will spark the interest of many kids, along with the beautiful illustrations by Justin Gerard. A &quot;must&quot; for your child's bookshelf! It's hard these days to find good Christian children's books, so I am pleased to recommend this book for your child's library. This is a wonderful story that communicates the fall and our need for a savior, while handling the common issue of being afraid of the dark. The lightlings are portrayed as faeries, which made them very appealing to my 4-year-old daughter, and she was quick to understand that the King of Light was God. The details in the illustrations help to convey the contrast between the light (inhabited by flowers and bunnies) and the dark (inhabited by thorns and spiders). I hope we will see more children's books from R.C.